I find this super interesting and engaging because it could fix the problem that occurs in many game genres where a soundtrack simply gets too repetitive after playing it for the 100th time, even if you do have different variations of a sountrack, eventually they will wear out. Games with repetitive aspects such as RPG's, fighters and racers really suffer from this. On the other hand, games like Ori and Journey can manage a very engaging soundtrack, but only for a couple of hours and even then there are problems with it. In Ori I remember I cleared the first escape tree without failure, which caused the soundtrack to sync up perfectly which made it epic. The later escape missions I failed a couple of times though and the whole epicness was torn apart because the track kept starting over and over again. It'd be interesting to see how a program will react to such kind of hard-resets when a player loses a life. In a way you want him to notice that he made a mistake, but hard-stopping the soundtrack leaves such a bummer in terms of sound. 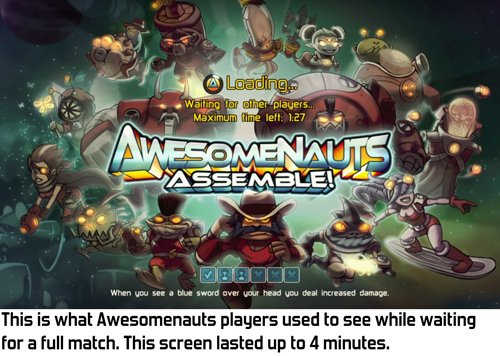 New blogpost on development of Awesomenauts! This one is about building matchmaking using the systems that Steam/Sony/Microsoft/Nintendo provide. In other words: the pre-Galactron era. I'm slowly working through the things we learned about matchmaking during the history of Awesomenauts. The next matchmaking post will be about why we switched from the system described here to Galactron. 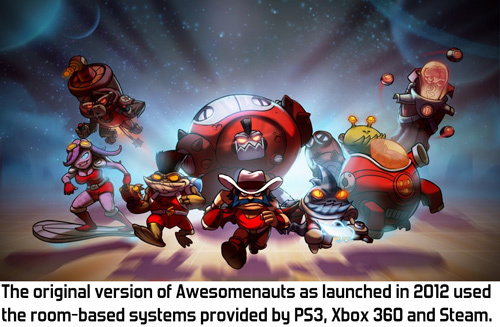 New blogpost about development of Awesomenauts! This one is about how we tried several approaches to matchmaking in the years before we added Galactron, and what problems we encountered with those. For example, the one in the image below shows why the old matchmaking system was much worse at matching premades with each other than Galactron. Oh, I can see this is going to cause so much discussion. The system itself is not bad, at all, dota uses it too for similar reasons. "In theory, it's great" is not the most reassuring thing in the world, I will admit. I can fly, in theory. New dev blogpost! This one is about how until 2016 we had a 4 minute static screen for matchmaking without any type of interaction, how we improved that a bit in 2016 with Galactron, and some ideas on things that could improve this further. add a (voluntary) deathmatch while waiting and have it be such that a kill gives you 1 awesomepoint. that way it doesn't matter who wins or if the matchmaker cuts the session off early.